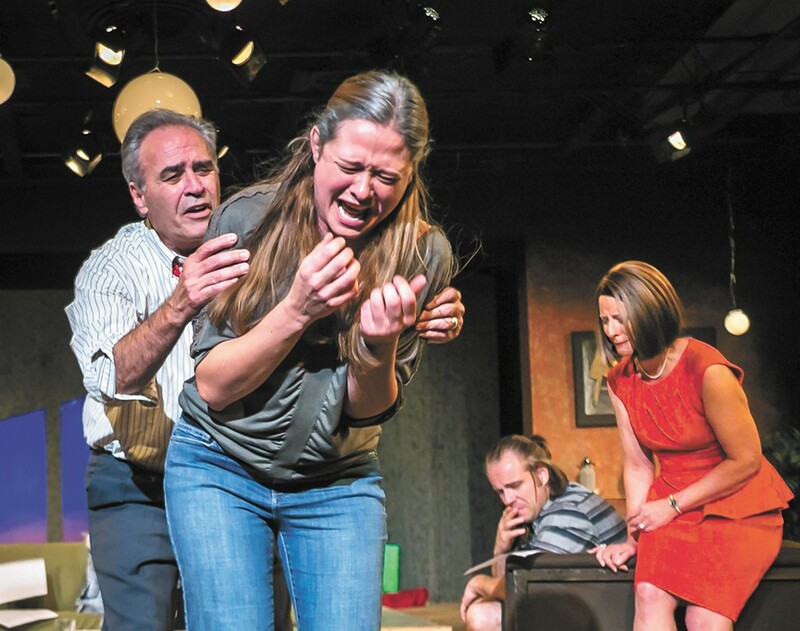 FROM LEFT: Wes Dietrick, Sarah Miller, Billy Hultquist and Diana Trotter in the Modern Theater’s Other Desert Cities. Other Desert Cities is said to take its title from a traffic sign along Interstate 10, a highway that leads out of Los Angeles and passes close to Palm Springs, the sunny resort town where the play's events unfold over the course of a fraught Christmas Eve. As quickly becomes clear, the "other desert cities" of California's Coachella Valley aren't the only ones the play is concerned with. The post-9/11 invasion of Iraq and the overwrought, fear-based sociopolitical climate that led up to it serves as a backdrop to this tense Wyeth family reunion. For Brooke (Sarah Miller), it's a long-delayed homecoming — delayed on account of a nervous breakdown followed by several years of self-imposed exile on the East Coast as she struggled to write a second book. Her brother Trip (Billy Hultquist; A Walk in the Woods) is there, too; he makes inane TV shows featuring the kind of washed-up stars his mother Polly (Diana Trotter) wouldn't deign to be seen with. She's a native Texan who has spent decades trying to bury her Jewish roots by rubbing elbows with a who's who of conservative WASP Hollywood. The Reagans, for example, are frequently invoked, provided it's understood who "Nancy" and "Ronnie" are. And, like Ronnie, the fame Polly's husband Lyman (Wes Deitrick; Frost/Nixon, White Christmas) enjoyed on-screen became a stepping stone to a political career that propelled him to new heights in the California GOP. These characters — along with Silda (Marianne McLaughlin; Gypsy, The Glass Menagerie), Polly's left-wing alcoholic sister — begin Jon Baitz's 2011 Pulitzer-nominated drama as clear, predictable types. Brooke is the childish idealist. Trip is a pleasure-seeking escapist. Polly is an unyielding, unapologetic bigot. Lyman tries to act as mediator. Silda is the sidelined, all-seeing sage. But in the family's reluctant and messy pursuit of something like truth, the walls of their pigeonholes break down. Their defining traits and glaring character flaws bleed into one another. Last season Miller came out of nowhere to deliver a noteworthy performance in the comedy Boeing Boeing. Here she proves she's got dramatic chops as well; the plot, after all, hinges on the immersive believability of her decisions and exchanges. Trotter plays a character not too far removed from her appearance last year as Vivian Bearing in Wit. She walks with rigid poise, speaks with chilly, clinical precision, and yet this tough shell is primed to crack. McLaughlin's stage time, though brief, is effective in adding to the dense — and draining — emotional texture of the play. Among the numerous highlights of this production is the unique and unexpected musicality among the actors' voices, so Baitz's confrontation-rich script takes on a symphonic quality of fortissimo and pianissimo, dal niente and crescendo.